The deep freeze has lifted -at least temporarily – and big race action returns to Seoul on Sunday with the first principal race of the season in the shape of the Segye Ilbo Cup. Twelve will line-up for the 1200M Listed racewith the likes of Seonbong, Power City and Yaho Sky Cat expected to head the betting market. The Cup is race 8 of a 10-race card at Seoul Racecourse on Sunday. There is also a live card at Busan. He won three in a row last summer, including the Ilgan Sports Cup. He was then off until the start of this month when he ran 6th behind Seonbong and Geomtan, a run which he should have come on for. He didn’t get forward that day although he finished well enough and should be more prominant here. One of the favourites. An outsider, he was relocated from Busan last summer and has a best of 2nd in five starts in Seoul. 9th in the race behind Seonbong on January 3rd, he will need to find plenty here. Well beaten by Seonbong over 1000M in Octboer, he followed up with a 3rd and a 2nd at class 2 both over 1700M. Likely to go forward early but others will be favoured here. Nicola Pinna has proven to be a big-race jockey since arriving here and he has an outside chance. Royal Star was a class 2 winner at 1000M in December and while she will need to improve in this company, she can go well. Strong claims to be favourite, he won class 2 races at 1000M and 1800M and comes in following back to back 2nd places at class 1. He beat four of his rivals here last time out and can beat them again. One on the up, he comes in following three consecutive victories, all of them at 1400M and all of them comfortable. He is yet to race at higher than class 3 so this is a big step-up in terms of opposition but there’s no reason to suggest he will be out of his depth and he will be backed. An outsider, it’s been a long time since the most recent of his six career wins. Lots of class 1 experience but nothing in his recent form to suggest he can make an impression on this. He was 3rd behind Seonbong but ahead of Power City last time on what was his first attempt at class 1. Prior to thathe was a solid class 2 winner over 1400M. He’s finished strongly on both his last starts and can be looking to find the money here. He has the fastest time of any of these at this distance, achieved when romping home on his most recent start at the end of November. He didn’t have much to beat that day and this is a big step up but he will look to get to the front straight from the gate and could be an interesting outsider. She ran 2nd to the promising OS Hwadap over 1000M in November and generally isn’t too far away. Others should be quicker here though. A stablemate of Forty Cure, he was last among the five of these who raced each other on January 3rd. He may once again find this field a little challenging. The venerable Magic Dancer isn’t quite the horse he once was and has struggled to make an impact since relocating from Busan. The drop back too this distance though could be very interesting. He likes to lead and flew through a barrier trial on New Year’s Eve before being 5th a week later over 1800M. He can’t be ruled out. The Seoul track is extremely dry at the moment and will be so tomorrow as well. Temperatures are set to be on the chilly side with highs around 0C. Which is still a vast improvement on last week. At Busan, the feature race is a class 1 event over 1400M and features a number of big names. Gamdonguibada, Beolmaui Kkum and Cowboy Son are among thirteen runners. There were no hard-luck stories this time. Success Story led from the gate and while passed in the closing stages, battled on for a gutsy 3rd place at the Dubai Carnival meeting at Meydan on Thursday night. In what always looked a very open race, Success Story, who was sent off at 10/1 in the UK betting markets, got away to a good start and under a tremendous ride by Tadhg O’Shea, was able to set a pace to his liking. Success Story would lead the field of fourteen into the home straight and to the furlong pole only to see 9/2 chance Top Clearance and 11/2 American Hope close strongly down his outside to best him in the closing stages. Under the urgings of O’Shea, the five-year-old would not be beaten out of the places though and held on for a very very good 3rd. He was two and a quarter lengths behind the winner on the line and a length ahead of fourth-placed Mind That Boy. If there was a feeling of “what-if?” after Cheongu had some bad luck at the start and then lost a shoe in running when recording a creditable enough 5th of 8 on his own Dubai debut two weeks ago, this time there can be no such thoughts. While only 3rd in what wasn’t the strongest race there’ll ever be, the result is no doubt a special moment for those who took him there. It also vindicates the decision of the Dubai authorities who took a chance on allowing the two relatively unknown Korean horses to travel. Watts Village won in Japan in 2013 on a night that won’t be forgotten by those who saw it. However, with all due respect, that was an invitational race on a Tuesday night at Ohi. This was Thursday at Meydan, in a race open to horses from all over the world. 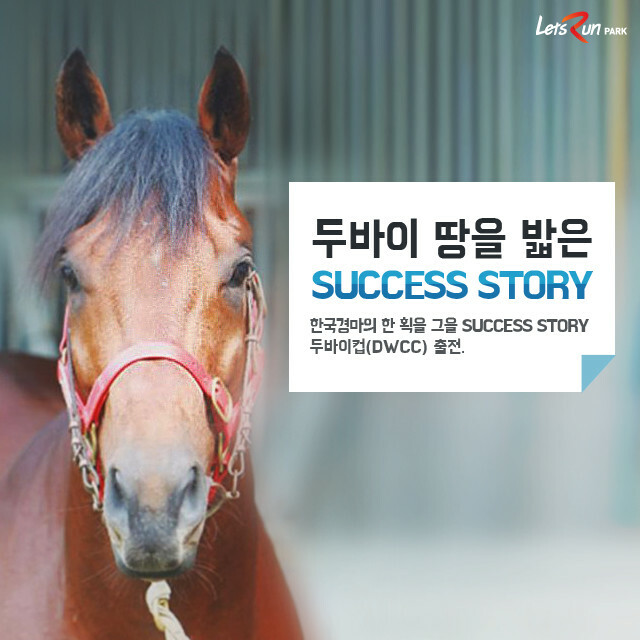 Furthermore, Success Story (Peace Rules) is Korean-bred as well as trained. The result should serve as an incentive for Korean racing – from the breeding shed to the racetrack – to redouble its efforts to improve. Not many owners in Korea can share a top three placing with Sheikh Ahmed Al Maktoum and Godolphin but Lee Jong Hun just did, surely others will want to as well. Plans for both Cheongu and Success Story are unconfirmed. Cheongu was originally set to be entered again next week but that may not happen. If Success Story comes out of the race in good condition and a suitable race can be found, he will get another chance. All we could really have asked for before they went is for them to look like they belonged there. Success Story did that and more tonight.